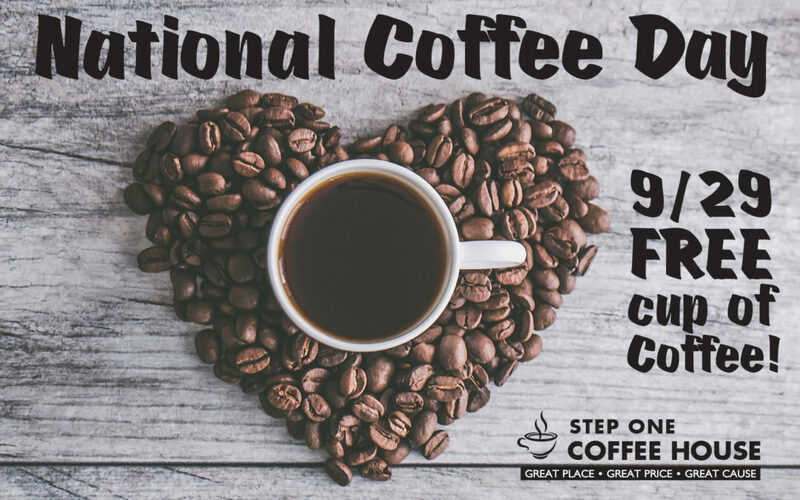 Stop by Step One Coffee House on Saturday, Sept 29 and enjoy a free cup of our locally roasted coffee in celebration of National Coffee Day! In addition, our friend Richard from Prescott Coffee Roasters will be there at 9 am for “Meet the Roaster” — it’s a chance to learn about our locally roasted coffee. You’ll also get the first taste of our special anniversary coffee blend in celebration of Step One Coffee House’s 15th anniversary! Grab a mug and enjoy your coffee with a breakfast sandwich, or take it to go on your weekend adventure. Either way, stop by and celebrate with us! Let us know if you’ll join on our Facebook Event! Interested in domestic violence information. Recently assaulted by woman and neighbor couple who were interfereing with their single elder neighbors life. I they intercepted my calls to this neighbor and gave him a fabricated story that upset his long awaited trip to Europe and his return. These aggressors assaulted me over giving them the key the owner had given me and I intended to return it to him. After the assault that bruised my wrists they entered the home before the man returned from vacation, and they removed the things I had left for him and the next week returned them to me saying he did not want them. He never knew I had left them for him. I call him and the aggressors intercept the calls. Seems to be theft of the man’s property! Hi JB – If you are ever in immediate danger or need to report a crime, please call 911. If you would like to speak with an advocate about your situation, please call our 24/7/365 Helpline 928-445-4673.